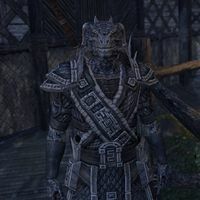 Ajim-Jaa is an Argonian who can be found in Lilmoth, he is the egg-brother of Mach-Taeed. "I don't buy Sulahkeesh's sweet granny act for one second. Once a Shadowscale, always a Shadowscale. That's why I pay my respects when I see her. You'd best do so too, unless you want to end up face down in the swamp with a slit throat." "I once worked with Cyrodilic Collections. Emphasis on once. Between their carping owner and that kuuda dryskin, I ended up quitting before my first day was done." "Want to have a good time? Head over to Bright-Throat Village. Want a quick death? The Dead-Water Tribe would be more than happy to accommodate you." "If you ever meet a priest of Sithis, try to talk as little as possible. Anything you say will just encourage them to keep spouting their nonsense. Xuth, we don't call them nothing-speakers for nothing." Ajim-Jaa's warning can be heard from him before Sulahkeesh appears, as she does not appear until the relevant quest step. He also warns Mach-Taeed to stay away from Sulahkeesh in the form of a letter. This page was last modified on 4 December 2018, at 20:54.